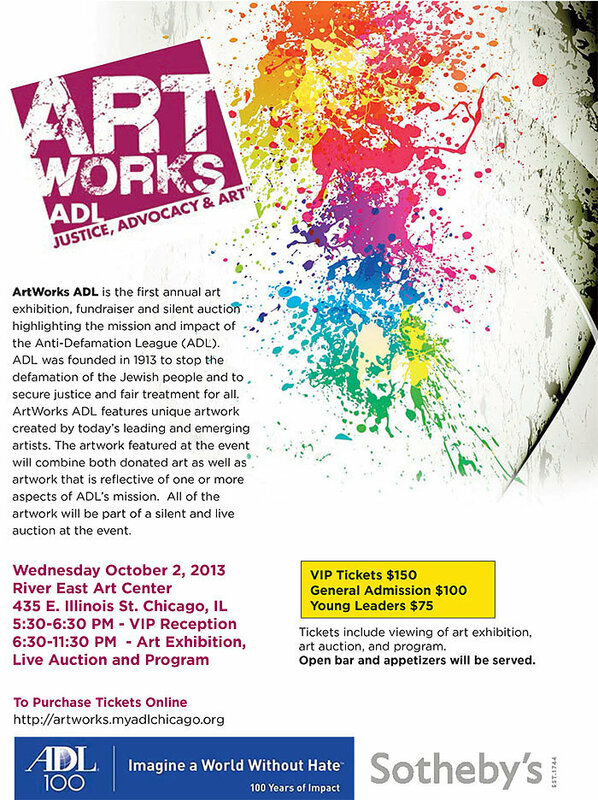 ArtWorks ADL is the first annual art exhibition, fundraiser, and silent auction highlighting the mission and impact of the Anti-Defamation League. ArtWorks ADL features unique artwork created by today’s leading artists. Each piece of artwork - painting, photography, mixed media, or sculpture - focuses on one or more aspect of ADL’s mission, including anti-Semitism/extremism/racism, education, religious freedom and Israel advocacy. The goal of ArtWorks ADL is to engage, empower and educate the Chicago community about the mission and impact of ADL through art. ArtWorks ADL will celebrate ADL’s achievements over the last 100 years and recognize the League’s critical work as the voice of justice and fairness for all who have faced injustice, hatred, or bigotry. Brandy Kraft has created a work of art specifically for donation to this event. Her artwork along with the work of 30 other Chicago artists can be seen at the exhibition on October 2nd and can be purchased via silent auction. ArtWorks ADL will take place this October at River East Art Center located at 435 East Illinois Street in Chicago. The exhibition will begin with a VIP reception with the artist at 5:30 PM, and the main event will be open to the public from 6:30-11:30 PM.